Stags' head physio Ross Hollinworth is to leave his post. Mansfield Town have signed highly-rated Stoke City defender Ryan Sweeney on a season-long loan deal. The 21-year-old signed for the Potters from AFC Wimbledon in 2016, and has since had two loan spells at League One side Bristol Rovers, during which he made 39 league appearances for the Pirates, scoring on four occasions. Sweeney made his professional debut for the Dons in April 2015, coming on as an 80th minute substitute in an away match at Dagenham and Redbridge. The left centre-half earned a place in the starting 11 in Wimbledon’s next fixture, a 0-0 away draw with Oxford United, in which Sweeney was named man of the match. The 6ft 3in defender soon started to catch the eye of Premier League clubs, signing for then-top flight side Stoke in August 2016. 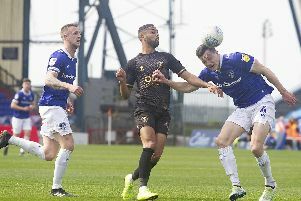 Sweeney featured heavily in Bristol Rovers’ campaign last season after joining on loan, and helped the Gas to a respectable 13th-place finish in League One.